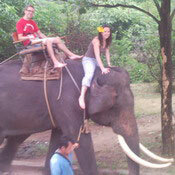 In the past they have been used at the forefront of battles and in more recent times to assist in the logging trade. 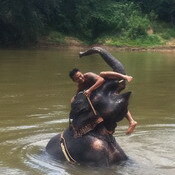 Now, visitors have the opportunity to ride and bathe them. 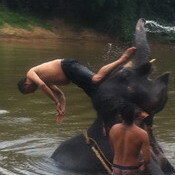 The mahout will jump off during your trek and invite you to slide down onto the elephant's neck and take control. 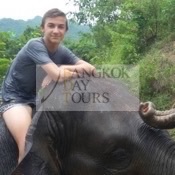 Be warned that their hair is prickly so shorts are not the best attire for this experience. 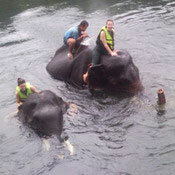 And also you will be able to bathe the elephants in the waters of the local river. You'll get wet, so don't forget your swimmers. We'll provide the life jackets for you if you want. 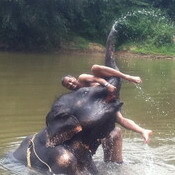 Not every tour includes bathing the elephants. 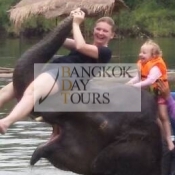 Please check the Tour Programme.